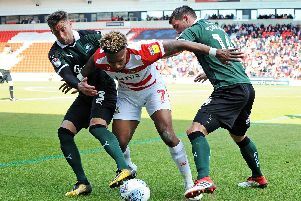 John Marquis has admitted that Doncaster Rovers have not counter-attacked as well as they might have done this season. Rovers broke up field to finish off Bradford City in stoppage time of Monday night’s vital victory - with Marquis emphatically rounding off a sweeping move for his 12th goal this term. John Marquis, centre, celebrates his second goal in the 2-0 win over Bradford City. But the 25-year-old striker says he and his teammates have not produced that type of goal enough since returning to League One. “We countered very well for the second goal,” said Marquis. “It’s something we’ve not done well enough sometimes this season when we’ve been leading games and putting teams to bed. Marquis did reserve praise for Niall Mason, whose superb cross led to the opening goal, and also his side’s miserly defending in recent games. He joked: “It’s not an easy sort of finish but when you’ve got a target as big as mine in the middle of the box - on my head - it’s hard for Niall to miss it! “It’s a great ball. All the pace was on the ball and I just had to direct it. “The three points were very important,” he added. “Apart from the one they had cleared off the line I can’t remember them having too many chances.